Don't miss any deals, subscribe to DealsSeeker with an email or RSS subscription or follow on Twitter. 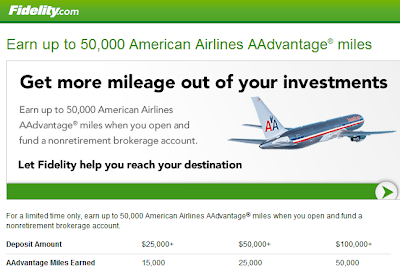 Open a Fidelity individual or joint brokerage account, fund it and earn up to 50,000 United/Continental miles; register here until October 1st, 2014 OR register for up to 50,000 American Airlines miles until September 30, 2012. According to the rules, you must be a new Fidelity customer in order to join this promotion with United/Continental or American Airlines. 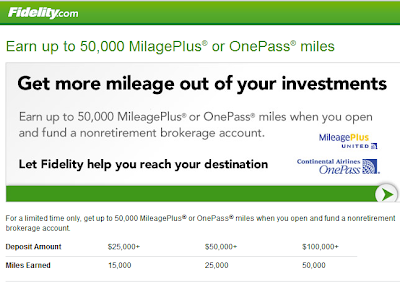 But I would suggest signing up even if you are not a new Fidelity customer and see if miles post to your frequent flyer account. Once you have signed up with UA or AA I suggest waiting until some miles from Fidelity post to your account. 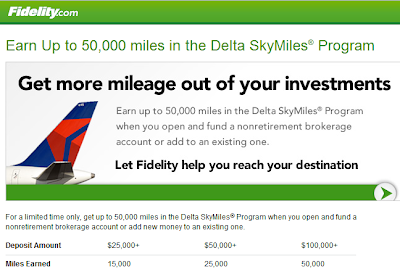 Once you see some miles from Fidelity you can then sign up for the Delta Fidelity Promotion which expires (February 14, 2012) now February 14, 2013 to earn up to another 50,000 miles. I have replaced the old link with the new one. With Delta, you can be an existing account holder, you just must fund it. 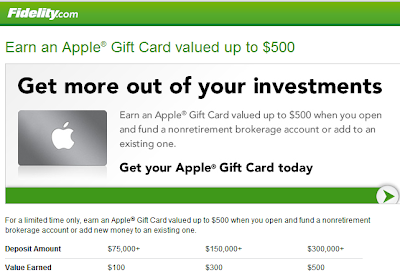 Then, you can register for the Apple promotion by June 30, 2012 to receive an Apple Gift Card valued $100 (for deposits of $75,000), $300 (for deposits of $150,000) or $500 (for deposits of $300,000). 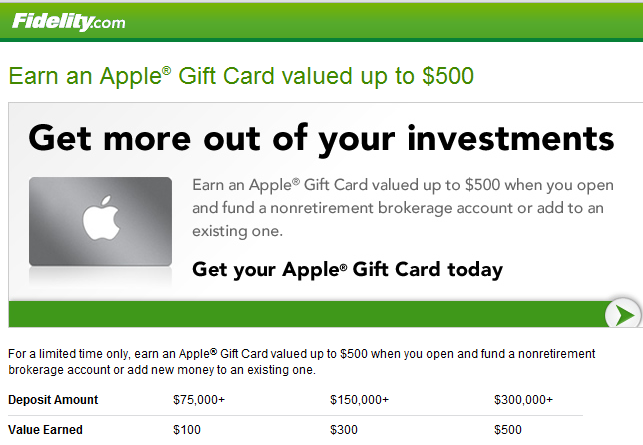 But you must complete the transferring within 30 days of signing up for the Apple promotion. If you only have $25,000 that you are cycling, you can chose to do the cycling before you actually sign up for the Apple promotion. Because $25,000 will need to be cycled 12 times in order to receive the full amount of $500. This was an idea put out on Flyertalk, but if it will work in actuality, I will let you know. You need to make a deposit of $100,000 to earn the maximum of 50,000 miles within the first 90 days (30 days for Apple) since you signed up for each promotion. You must at least deposit something within the first 30 days. See below for the exact amounts with each promotion. You do not need to keep the entire amount in the entire time. You need to TRANSFER (Fund) $100,000 all together . What Flyertalk members have been doing is funding and withdrawing $25,000 until they reach the $100,000 transfer. The first time you fund the account, you can't withdraw it back into your bank account until the bank account has been verified, which takes about 7-10 business days according to Fidelity. Otherwise it takes about 5-7 days for each fund/withdraw cycle. 1) How could I be first time customer for United promotion if I already created a fidelity account for AA promotion; or the other way round?? 2)How often did you withdraw and deposit money to reach 100k limit, without getting under trouble? I am thinking about depositing 15k and withdrawing after 2 days, and I will do that for 7 times to reach 100k. I will be done in 2weeks+ 1 week(for the activation of my bank account). Do you think it will work. Any advice?? You need to either choose to get miles with AA or United. You can't get for both. After signing up for either AA or United, then you sign up with Delta. Bastically, all in all it took me 1 month for 4 cycles. It takes some time for you to be allowed to withdraw once you have deposited the money. Around 1 week. When it shows that you can withdraw, you should, and then you do it all again. I initially deposited $27,500 and kept on withdrawing/depositing $25,000. I am keeping $2,500 in the account. But 15k is perfectly fine. They do charge around $8 every time you withdraw or deposit, I forget which one. But that's just pennies compared with what you are getting. Using just 15k, you'll have to deposit and withdraw more times and pay the fee around 7 times instead of 4. Let me know how it works out, and feel free to ask more questions. Thanks for your quick response. I am a newbie in this game; hence my Q's may sound dumb. Ok, so I signed up for Fidelity/United promotion today and I did a small $5000 transfer. I looked around a lot if I can get a $50k loan for couple of weeks but I couldn't find anything. Anyways, I will continue to fund this fidelity account with my $15k savings. Should I go ahead and register for delta promotion now because It will end tomorrow? or should I wait 24 hour between 2 registers (United and Delta)? 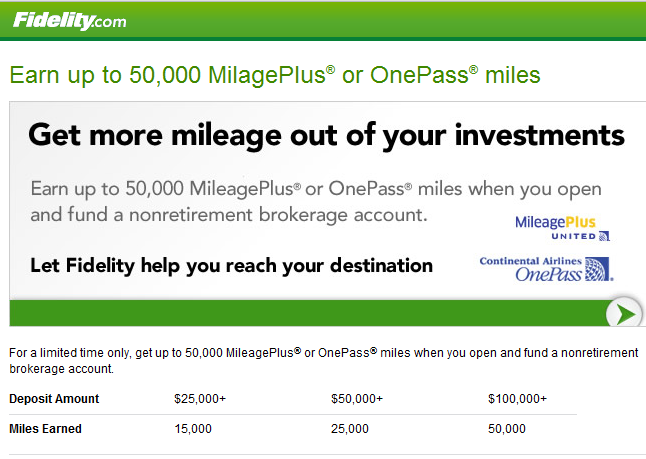 I believe my 100k funding in fidelity will count towards both promotions, United as well as Delta, right? Anonymous, please read today's post or click on the Update 2 link on top of this post. Just found your blog. Great article! May I ask how long would it take for transferring X amount from TDAmeritrade to Fidelity? I can then deposit Y amount (recycle it) to the account within 30 days. It is required $100k for 90 days, correct? Thanks. Thank Nguyen! Don't forget to sign up for my daily emails, as not to miss any deals. I will try to find out how long that takes. You have 30 days to start the process for the airline miles and a total of 90 days to cycle (up to 100k). You only have 30 days to cycle for the Apple deal. I haven't gotten a response from anyone at Flyertalk for my query about how long it would take to tranfer the money from TD to Fidelity, but why would it take any longer than a regular bank account? I imagine it is the same amount of time. Yes, it probably takes the same amount of time. Thanks for all your help. I will start looking into this after my refinance closes in a couple of days. I started my first transaction with Fidelity on Feb 17th and my money in Fidelity is not available to send back to my bank account until Feb 24th. May be the first transaction takes longer than following. I am such an optimist!! Yes, the first transaction takes longer because they need to validate your bank info. If you have a spouse, you can get the Delta offer for him/her too now, since it no longer states one per household. Just to clarify your post. You said not to sign up for both promos at the same time. However on FT lots of people say you can sign up for the Delta & Apple before you receive the original UA or AA points. In fact, that seems to be the suggest course of action. You are correct about that and I'll change my post to reflect that. But, I do think that it's best for people that need a confirmation to do the UA/AA promo first so that if they want to call, they can. On my Feb 5th update I do say that I applied for all three at once and it ended up not being a problem. I received everything. But I DO recommend waiting a bit between the first promo and the second. Read my adjusted post above to see why. I just had a chat with fidelity support and she told me that I can sign up for only one of the United/AA/Apple promotion, not all. I just wanted to let you know. I might open a fidelity account for my wife and do this same transfer. but that's it, I can get only 2 promotions at most.. According to the terms and conditions, that is correct, you can only take advantage of 1 promotion..
ask questions about it. Just enjoy all the extra miles and if you have any questions I will be happy to answer as will everyone on Flyertalk and Milepoint.Good luck to you!